Julia Greeley is known as Denver’s Angel of Charity. She was born into slavery in Missouri, sometime between 1833 and 1848. While she was still a young child, a cruel slavemaster left Julia blind in one eye. 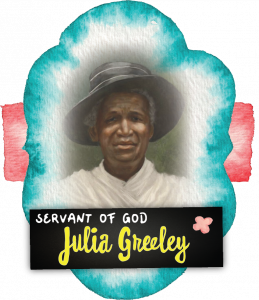 Freed by Lincoln’s Emancipation Proclamation in 1863, Julia subsequently worked for families in Missouri, Colorado, Wyoming and New Mexico though mostly in the Denver area. Whatever she did not need for herself, Julia spent assisting poor families in her neighborhood. When her own resources were inadequate, she begged for food, fuel and clothing for the needy. One writer later called her a “one-person St. Vincent de Paul Society.” To avoid embarrassing the people she helped, Julia did most of her charitable work under cover at night through dark alleys. Julia entered the Catholic Church at Sacred Heart Parish in Denver in 1880, and was an outstanding supporter of all that the parish had to offer. The Jesuits who ran the parish considered her the most enthusiastic promoter of devotion to the Sacred Heart of Jesus they had ever seen. Every month she walked to and visited every Fire station in Denver and delivered literature of the Sacred Heart League to the Firemen, Catholics and non-Catholics alike. She went to mass and received communion every day. She had a rich devotion to the Blessed Sacrament and the Blessed Virgin and continued her prayers while working and moving about. She could neither read, write nor count. Her marvelous piety and her constant charity made her the friend of everybody. She died in 1918 of a sudden illness. At her funeral limousines came carrying the rich to see her. The poor Flocked to the chapel in throngs. Her process of canonization has started and she is remembered as a servant of God.